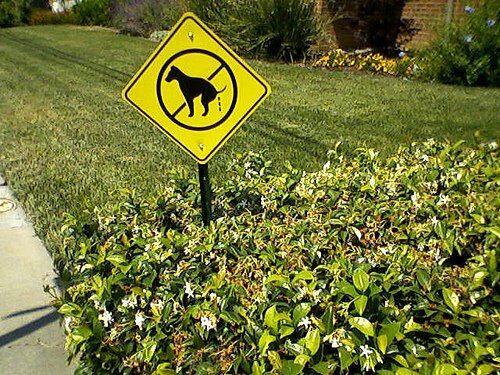 Is it worse to a) have the occasional poo left in your front lawn by an irresponsible dog owner, or b) have your yard fouled every single day with a picture of a dog pooing in your yard? 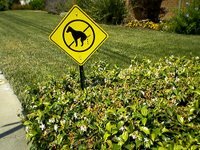 While I'm not sure I'll ever know the answer to the above question, I cannot help but wonder if the homeowner went out of her way to seek a sign like this to post in her yard, or if it was just a serendipitous find she just had to have. It's a rare moment when everyone in my family is happy simultaneously. So it seemed a little off to flaunt that picture of me with two smiling babes at my side. As a result--in case you didn't notice--I swapped that photo out for something a little more realistic. Thanks for writing. I always appreciate insightful comments and criticisms from people who comment on my blog. The open communication is part of what makes blogging so enjoyable. It's the anonymous people who offer up criticisms that I find irritating. I'm entitled to a pity party anytime I like. That is one of my rights as the mom of two young kids, who--like most kids--have the ability to be naughty. Just today, for example, Preschooler in Chief thought it would be a good idea to saturate the family room with the hose. It was hot out, so I can see why he thought it might be a good idea to cool things down in the house. But in actuality, it was a bad idea. Soggy books, drenched toys, and a wet wool carpet contribute to the overwhelmed feelings that I wrote about Sunday, which in turn, prompted your comment. It is my kids' jobs to push the envelope as they learn boundaries and figure out how they fit into our family and our society. And, yes, it my job to reel them in and help them understand right from wrong in a loving and supportive environment. I can love my kids and hate my kids at the same time. It's mommy multi-tasking. It's a complexity of the human condition. And, by the way, it's totally normal. Your lame suggestion that perhaps I need a little gratitude shouts that you know nothing about me. While I am currently frustrated and tired with the mundane parts of parenting, I'm filled with gratitude. If you've read much of my blog you would have found countless posts that acknowledge my generous husband, our supportive family, and our network of amazing friends. You would have found posts that find humor in my kids' quirky behaviors. You would have found forgiveness and glimmers of goodness squeezed between hospitalizations and medical drama. I, more than anyone, know all about my son's medical condition and how lucky and appreciative and thankful I am for the technology, the surgeons, the friends, family and medical staffers that have helped my family through hours, days, weeks, and months of being in the hospital and being surrounded by the possibility of death. I, more than anyone, know all about being grateful that my kid is alive. That my kid has been out of the hospital and has led a relatively healthy and normal life for more than a year. I, more than anyone, know that everything can change in a minute. I, more than anyone, know that there will be more hospitalizations. That there will be more surgeries. Because you don't really know anything about me, you can't possibly know what I think or what I feel or how I struggle with the life I've been given. I don't have the luxury to know what it's like to raise two healthy kids. I don't have the luxury to be blissfully ignorant about the future. I have never known--not even for five minutes--what it is like to be a mother without thinking that my son is going to die. And don't think that I don't know how all that knowledge makes all my frustrations and guilt that much more complex. I specifically remember during one of PIC's hospitalizations that I was just constantly grateful that he was breathing, that his tiny body was still living, despite the massive trauma it had been though. I felt that way for several weeks after he was discharged too. And then one day, I got angry at him for something. I remember that moment as being profound because it meant that things were going back to normal. And that was a good thing. Just because PIC has medical problems does not mean he gets a free pass. It does not mean that we'll never argue or disagree or that he'll never get on my nerves simply because I'm grateful he's alive. It doesn't work that way. I'm doing my best to treat him like a normal kid. To praise him no more and no less than a kid who has not had five heart operations. To punish him no more harshly or less harshly than his heart-healthy little brother. I'm doing my best to treat him as normally as possible. So that means I have the right to get annoyed with my kids and the mundane and repetitive part of parenting. It doesn't make me a bad person. It makes me human. Finally, thanks to everyone who offered support and advice. It has been a rough couple of weeks, but I'm taking steps to get out of this slump. I'm tired of making the same snacks. I'm tired of wiping up the same spills. I'm tired of hanging up the same clothes. I'm tired of washing the same diapers. I'm tired of the bickering. I'm tired of tripping over the same toys. I'm tired of brushing other people's teeth. I'm tired of wiping other people's butts. I probably should be fired. I'm tired of the monotony. I'm tired of the no-end-in-sight. I'm tired of the screaming. I'm tired of hating my kids. Isn't nurturing supposed to be hard-wired? I can't remember why I craved this role. I can't remember why that other life took such a toll. I can't remember the last time they made me smile. I hate that this life, this choice does not seem worth while. For the past five years, (medical) drama has become a normal part of everyday life. With Preschooler in Chief either heading into the hospital, having an extended stay at the hospital, or recovering from his many interventions, surgeries, or procedures, drama is just part of our normal lives. When he was discharged last spring after an eight-week stay, we were convinced that he'd be back in there within a couple of months for additional time-buying surgeries to avoid the inevitable heart transplant. Only he got better. He recovered. He started growing. He started having energy and feeling good. So here we are almost 14 months without a hospitalization, without that normal drama. That is a record that we hope will get more impressive with each new week. When Computer Security Friend was at our house for dinner last week, he said, "When you don't have drama in your life, you make your own drama." He was referring to some of the older women at his church who were in a tizzy because the pastor had some pregnancy photos done. And you could actually see the skin on her belly. And her husband was touching that unclothed skin. The horrors! His comment got me thinking. Since I don't have PICs drama to occupy my thoughts, have I been summoning unnecessary drama into my otherwise peaceful life? I've been worrying about my age as the 35-year-old milestone approaches. Along with that, I've been worrying about the little lines around my eyes. I've been worrying about my sexuality. I've been worrying about the less-than-perky pieces of flesh that nourished two babies for almost three years. I've been worrying about my legs and the fact that they will never be flawless. They weren't when I was 12; they aren't now that I'm 34. In the meantime, I'm filling my calendar with doctor appointments as I cling to what I see as my fading youth, beauty, and sexuality. But that's just the little stuff. I've been worrying about where I'll be 10 years from now. With two new rejections arriving over the weekend, I wonder if I'm going to find an agent. I've been worrying if my marriage is strong enough to make it through all of this worry and stress and drama and individual goals and aspirations that ultimately take us in different directions. I'm sure some of this is the fact that our 10-year wedding anniversary in approaching and I don't know many people who have had successful long-term marriages. I've been so overwhelmed with these things that I worked myself up into having some kind of panic or anxiety attack a few days ago. Four pounds have been shed in two weeks. My resting heart rate was hovering around 125 beats per minute (normal is 60 to 80). My stomach was in knots. Eating was difficult. Sleeping was traded in for a reclined physical rest as my brain raced with all of my flaws, my failures, my unfulfilled aspirations. Medications have been prescribed. Anxiety has been temporarily toned down. Is there such a things as a normal and balanced life? The more I look around, the more I'm convinced it does not exist. Everyone has some kind of drama--work drama, kid drama, health drama, marriage drama, family drama, fertility drama--nagging at them.